For those who know me, or have read this blog for awhile, you'll know that I am a huge Harry Potter fan. The books are my favorite books (I'm partial to Prisoner of Azkaban as my top favorite, though) and I went to pretty much every midnight showing whether it was a movie or book release. I had heard rumblings of a Harry Potter game being released that was somewhat along the lines of Pokemon Go, but I had no idea that it was already available until my friend came to lunch one day, asked me if I was playing and immediately told me to download it. Which I did, and I haven't stopped playing since. 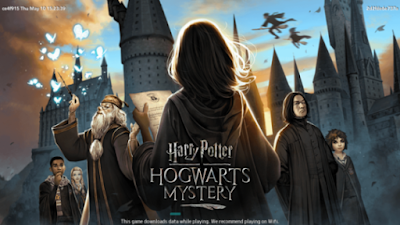 Hogwarts Mystery is a video game developed by Jam City for mobile devices and was released at the end of April. In the game, each player gets to take on the role of a Hogwarts student, like you create your avatar and can even give yourself a wizard-y sounding name (I wasn't creative enough, so I just left mine as Heather) and then you basically just go through the seven years at Hogwarts. Aside from taking classes, you can even take part in extracurricular clubs and activities. The basic story line is that you're the sibling of a wizard named Jacob who has recently been expelled from Hogwarts for attempting to open the "Cursed Vaults", a hidden vault that's rumored to be at the school. Throughout the game, the player has certain choices to choose from which determines the path of their character and their relationships with others. Each year is separated into Chapters: Chapter 1 is basically you getting your wand, books, etc; Chapter 2 sorts you into your house and you start taking classes, and so on. Since the game takes place before The Boy Who Lived, we get a whole new group of familiar characters to interact with. Instead of being classmates with Harry, Ron and Hermione your peers are Bill and Charlie Weasley and Nymphadora Tonks. The game also includes the teachers as well, so you still get to bask in the glory of McGonagall (Maggie Smith even reprises her role and does the voice over), Snape and Dumbledore. And the classes! You get to participate in everything from charms and potions to transfiguration and flying. So far, I'm enjoying this game. It reminds me a lot of back in middle/high school when everyone was super into the Sims. There are some dull parts, but that can be expected. The only real drawback I've found is that you seem to run out of Energy points really quickly and you need those points in order to finish tasks and whatnot, but I've heard there are ways to bulk up the points but I haven't found them yet. All in all, it's a nice little way to pretend I actually went to Hogwarts. Has anyone else been playing? What do you think? Lemme know! I liked the game ok, but I had to delete it, it used up too much battery and space. I also didn't like how much energy it took to complete simple tasks.